My wife and I recently missed one of our favorite church services of the year – The Question Box Service. For a few weeks leading up to this particular Sunday, parishioners are typically invited to submit questions for the ministers to respond to. These questions can be of any number of varieties – philosophical, ethical, political, personal, whimsical – and tend to be very wide ranging. 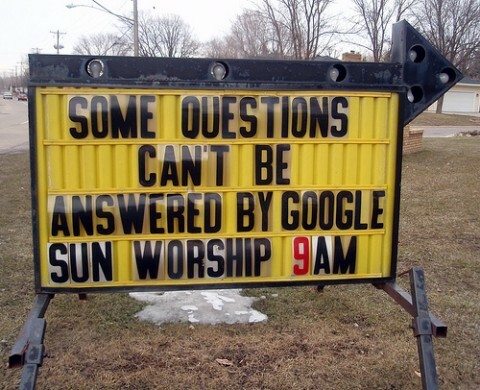 The answers to selected questions become that day’s sermon. As interesting and entertaining as it is to hear the clergy offer their spontaneous reflections (they dress down for the occasion, doffing their robes and sitting crossed-legged on stools in front of the pulpit, a la talk show hosts), I find the questions themselves fascinating, especially when artfully phrased. Just the reading of the card can elicit a ceremonious “oooh” or “ahhh” from the listeners. There is just no doubting the power of a good question. Much has been said about this elsewhere, and there are group methods (Appreciative Inquiry, World Cafe) that are firmly built upon the fine art of inquiry. The iconoclast writer/journalist Brenda Ueland once wrote about the transformative effect of asking good questions and listening, saying that their power resides in the potential to birth possibilities and bring people and ideas to life. Good questions can really have that effect. Speak to where people are. Are clear and often deceptively simple. Invite deeper reflection and/or a shift in thinking. Speak to fundamental values, hopes, aspirations. Focus attention on what is possible. What is something you hope to get from this group and what is something you are prepared to give? What is the biggest assumption you have about this matter? What are you most curious to know about other people at this table? What is the story you want to be able to tell about our work together? What is the most important conversation we must have right now? What core commitment(s) do you bring to this work? What possibilities exist that we have not yet uncovered? If our success was guaranteed, what would you be willing to do together? And of course, now I want to hear yours! Help me fill up the box. What would you do if you knew you could’t fail? Thanks Cynthia and Gibran. Another powerful question came up in a conversation with friends over dinner last night – “What’s the worst that could happen?” Good one for helping us to regain perspective! Thanks for this post. When a powerful question is asked, it’s such a provoking and energetic exchange as if somehow “we got it!” Here’s one: what are you building?